I went to Ultimate Fit today at the Y with Amy (my friend & workout buddy) - and this was our workout! It was a partner workout, so we would take turns doing reps. I would do 10 reps, Amy does 10 etc. until we complete the exercise. I run 200m and then Amy runs 200m. So while your partner is working, you are resting. It was hard but we completed it and feel accomplished! 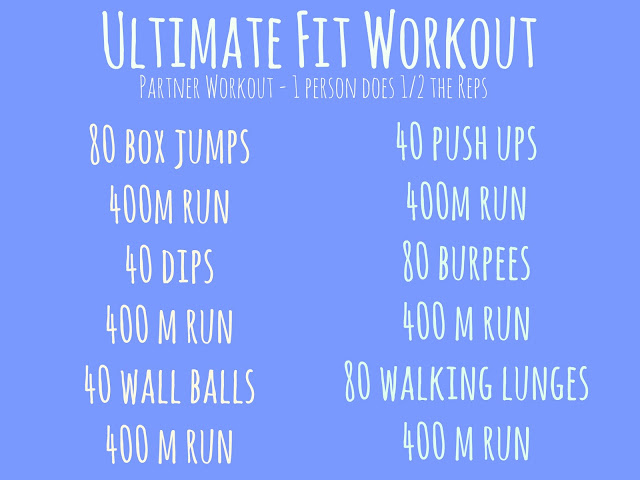 I like the idea of a partner workout with built-in rest time. Looks like a great workout! The rest time was definitely needed! It made the workout more bearable! Hi, this is her sister. It's on our end. Allison tragically passed away in 2016. We have chosen to leave her blog up though. I need to go in and fix the images.